The move came after the County determined in June that the salt storage tank it has used on the site for decades is so badly deteriorated that it is unsafe for further use. The Old Dominion facility, together with a second facility at the County’s Shirlington Trades Center, ensure efficient snow removal across the County. Sixty percent of the salt that the County applies to streets in winter snow storms is kept at the Old Dominion site. The more modern, sturdy structure at the County’s Shirlington Trades Center holds the rest. “Although frustrated that the short timeline allowed for few creative options for this interim facility, the Board members agree that Arlington County must be prepared to efficiently and effectively handle snow and ice to keep our roads and residents safe this winter,” Arlington County Board Chair Katie Cristol said. The County proposes to erect a temporary storage structure this fall at the Old Dominion Drive site, near the failing metal storage tank, which will be emptied of salt and demolished. The Board voted unanimously to advertise September public hearings before the Planning Commission and the County Board. The hearings will consider a proposed rezoning from S-3A “Special District” and R-6 “One Family Dwelling” District to P-S “Public Service” District for four parcels, a total of about two acres on Old Dominion Drive between 25th Road N and 26th Street N.
To read the staff report, visit the County website. Scroll to Item No. 60 on the agenda for the Tuesday, July 17, 2018 Recessed County Board Meeting. View the staff presentation, which includes an explanation for the siting decisions, and why it was deemed not feasible to build the interim salt structure on the leaf mulch site (slides 13-16). Expressing frustration that nearby neighborhoods were given little notice of the need to build a temporary salt storage facility at the Old Dominion site, the Board promised that engagement with the community over the long-term plans for the site will be robust. 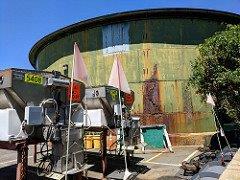 Dilapidated Old Dominion salt storage tank. In the coming weeks, the County will order the temporary structure, and conduct a geotechnical survey of the site, Director of Environmental Services Greg Emanuel said. In mid- August, the County will begin to clear the site of shrubs and, where necessary, trees, to make way for the temporary structure. After feedback from the community, County engineers are exploring a “tree-saver” option for placing the interim structure on the site that will preserve as many trees as possible. At the Board’s direction, the County Manager will provide details at the September Board meeting on the scope, community engagement process and timeline for master planning the entire 7.5 acres that the County owns at the Old Dominion Drive site. That long-delayed planning process will begin in the first quarter of 2019, last for nine months, and include a one-acre park. Having two snow storage sites, one in the northern part of Arlington and the other in the southern part of Arlington, ensures the capacity, efficiency and safety needed to work salt spreaders around the clock during winter storms, by minimizing travel time during snow operations. 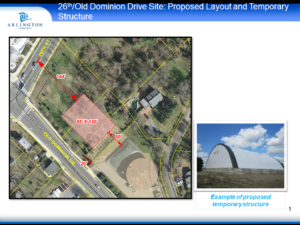 The County is proposing building an 85-foot by 120-foot hangar-like structure at the Old Dominion site, of canvas skin and steel trusses over a concrete block base. It would duplicate the location’s 6,000-ton salt capacity. Currently, the County stores most salt at the site inside the dilapidated 1930s-era converted water tank, with the rest kept beneath a large industrial tarp next to the tank. The interim structure, if approved, is expected to be used for three to four years, while staff and the community go through the master planning process, which is expected to start in the first quarter of 2019 and last for about nine months. One of the planning tasks will be finalizing a location on the site for a permanent structure. The three-to-four-year timeframe will allow for planning to be completed, and then the procurement, design and construction of the permanent facility. The County’s plan will require the removal of some trees, and the addition of an asphalt base, truck path and another curb cut. The County owns seven parcels at Old Dominion Drive and 26th Street N, a total of more than 7.5 acres. The area proposed for rezoning is boarded by Old Dominion Drive, and is near the Old Dominion, Yorktown, Donaldson Run and Rock Spring neighborhoods. The Solids Master Plan will significantly upgrade the Water Pollution Control Plant's capacity for safely handing solid waste.